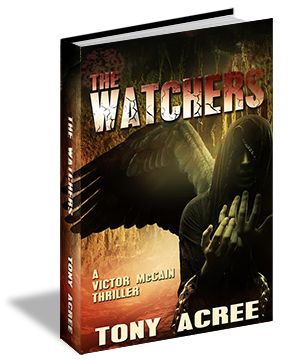 The Watchers, the sequel to my bestselling thriller, The Hand of God, is now available on Amazon Kindle. For bounty hunter Victor McCain, life is complicated. After losing his soul, he agreed to become the new Hand of God, God’s bounty hunter on Earth. His job? Track down and kill the worst forms of evil Satan can dish out. But when an ancient threat resurfaces, soon the hunters become the hunted. In this action-packed sequel to The Hand of God, Victor is closing in on his brother Mikey, who cost him his soul and stole the woman he loves. Soon he discovers his brother’s “back up” plan: to unleash beings chained in the darkness from the early days of man in order to bring about the annihilation of the human race. With the help of fellow bounty hunter Winston Reynolds, computer geek Kurt Pervis, and the enigmatic Brother Joshua, Victor is ready to spring his trap and rescue the lovely Samantha when it all goes sideways. Now each member of his team is being targeted for elimination. The only question is, can they stay alive long enough to save the world.